There is just something so appealing about wooden toys. When I think of wooden toys, I imagine Santa and his elves working away in the workshop creating wooden toys of all different varieties. To a young child, a wooden cylinder can become the building blocks for a tower, a baby to tuck in at nap time, or food to be cooked up in a play kitchen. The possibilities are endless! One of my favorite toys growing up was a wooden block given to me by a contractor working on my parents’ house – now that requires some creativity! Many of us have fond memories of Lincoln Logs, wooden blocks and other classic toys. These toys are simpler and evoke more imagination in the hands of little ones. Critics of wooden toys say that the toys are less engaging, but wooden toys do not have to be boring. There are numerous artisans making wooden toys that go well beyond the pet block days of the past. Puzzles, memory games and other educational toys are now being crafted out of wood, and toy makers are beginning to recognize the appeal of natural toys. With the threat of chemicals used in plastics, wooden toys are growing in popularity among parents these days. Are plastic toys safe? Many parents are unsettled by the answer – maybe. News has exploded in the past few years with studies of BPA, phthalates and plastic toy recalls. Wooden toys aren’t without problems, however; cleaning the toys can be difficult, they are more easily damaged by moisture, the initial cost is often higher, and splinters or sharp edges can be dangerous. Some cheap wooden toys that were made in China contain lead infused paint which has been proven to be harmful to children. Some toy makers are mindful of these concerns and specifically use techniques that do not involve toxic chemicals to create their crafts and will replace splintered or broken toys at no cost. Other toy creators are looking to safe paint solutions to use on their toys. First, look for toys that are unpainted, unfinished or made without toxic chemicals. Toys painted with water-based paints or milk paint are a good alternative if you are looking for a bit more color and variety in toys for children. Parents can learn how to properly clean wooden toys by doing a bit of research on the internet. Keep up with toy and other product recalls by registering your purchases with the manufacturer. You can view a toy safety guide by visiting the US Consumer Product Safety Commission’s website. The simple shapes of wooden toys may seem like a drawback in the commercialized culture of the United States – kids are susceptible to advertising and will want toys featuring the latest characters from cartoons and movies. These promotional toys are far too profitable to for big toy manufactures to abandon them. I loved the Smurfs when I was growing up but if I asked my niece who Smurfette is, she would be clueless. To me, this is one of their greatest strengths – the simple wooden toys of our time still draw the attention and imagination of children today. I find it unrealistic to believe that most toys will go natural or “green” but the timelessness and longevity of wooden toys will allow parents to purchase toys that can be passed down from one child to the next, sometimes even to the next generation. And while I know it is likely that my two year-old niece will discover Dora the Explorer and the mass of items with her likeness, it is nice to dream for a while and imagine that we live in simpler times. 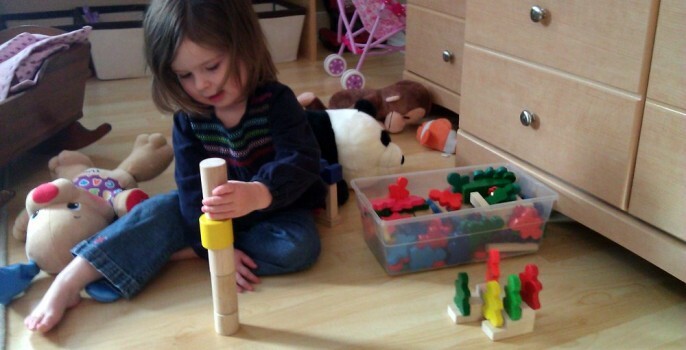 There may yet be hope – after all, that is her in the photo above playing with some of her many wooden toys.